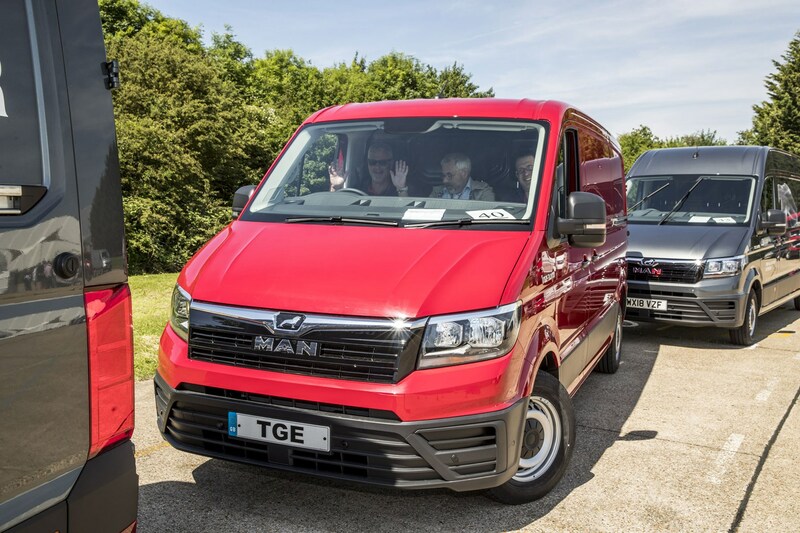 It’s not often that a new van manufacturer arrives, but in 2016, truck and bus maker MAN announced that it was going to enter what it calls the ‘light van market’. 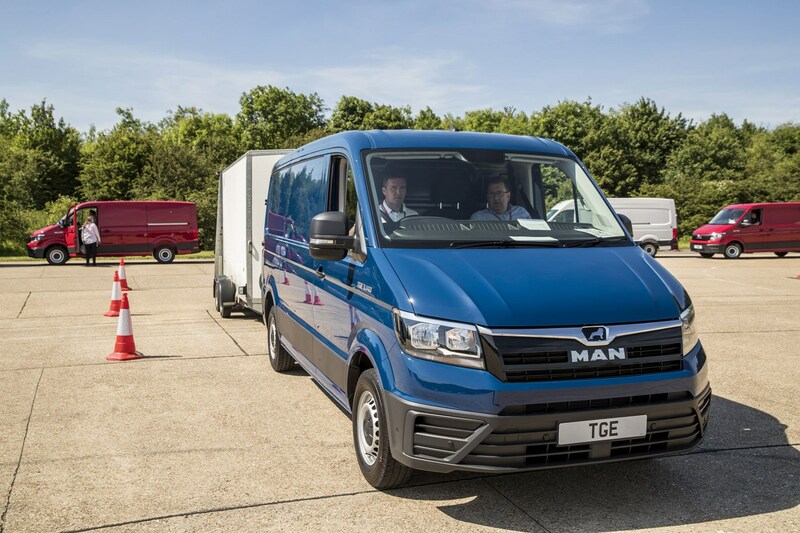 The resulting MAN TGE, on sale in the UK from late 2017, actually falls into the traditional large van category, and became a new rival for the likes of the Mercedes-Benz Sprinter and Ford Transit. 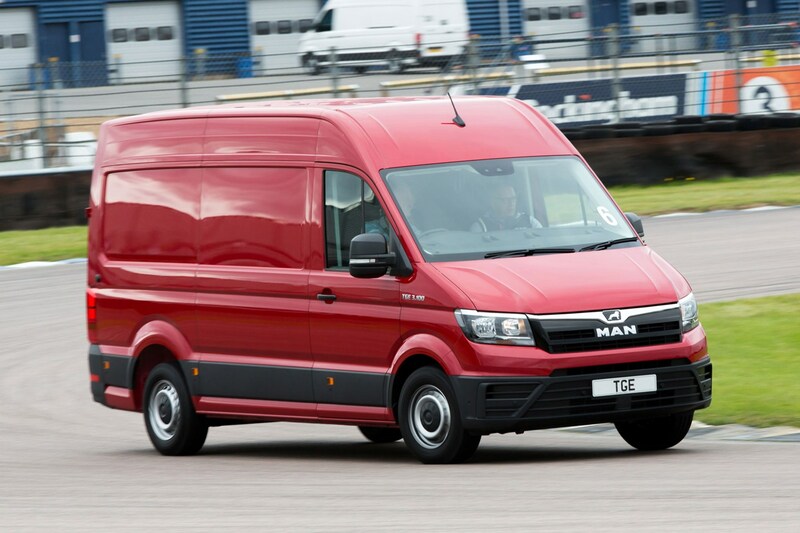 This is not really a completely new van at all, however – it’s a re-branded version of the latest Volkswagen Crafter. 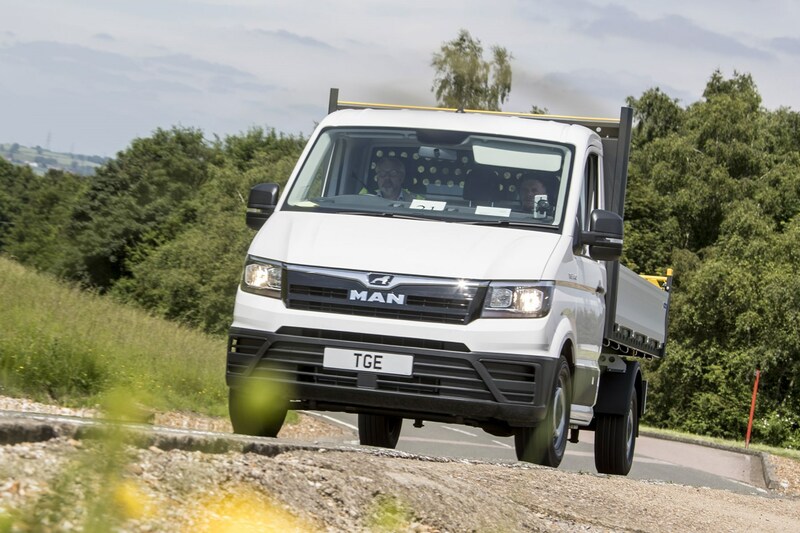 But while the visual differences may be slight, TGE buyers will have access to MAN’s extensive after-sales network and support, including round-the-clock servicing. We’ll detail this further later in the review. 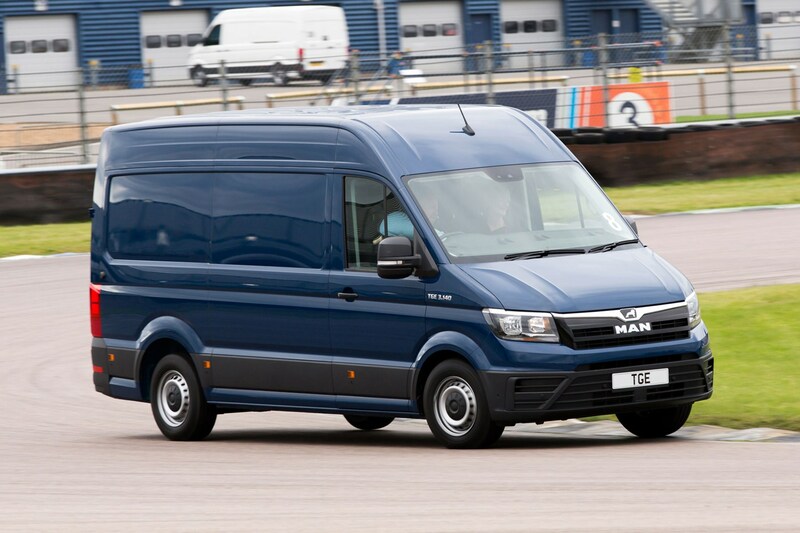 First thing’s first, the MAN TGE really is a straight copy of the Crafter. It’s made in the same factory, comes with the same range of body and drivetrain options, and aside from the badging and a few pieces of interior trim, it’s all but identical. That is a very good thing. 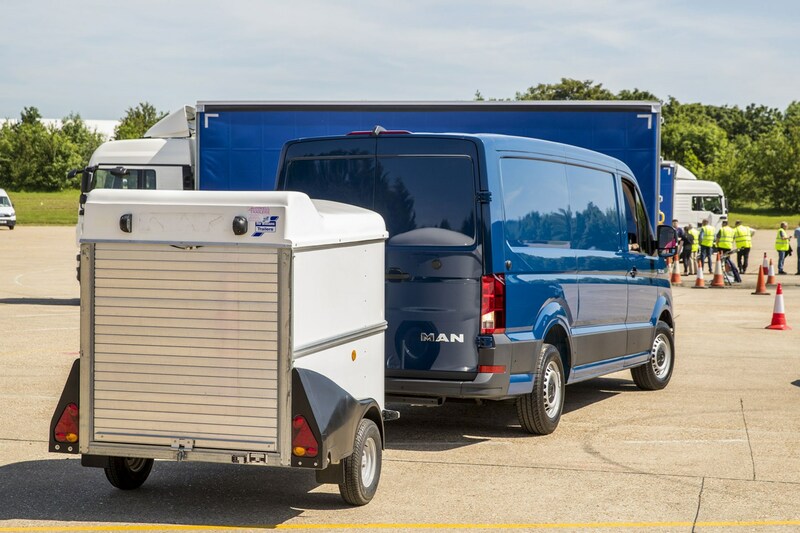 The Crafter won our Best New Van Award in the Parkers New Car Awards 2018, putting MAN in a very good position to start selling vans. 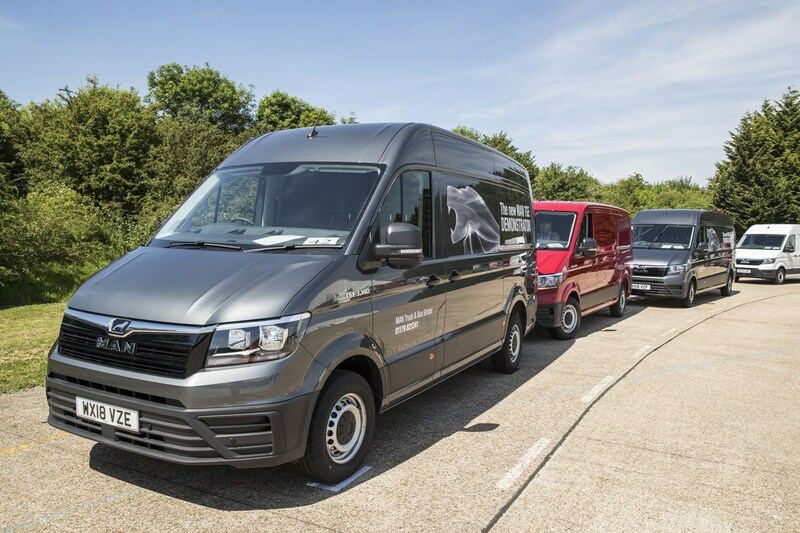 The TGE is available with the same four versions of VW's latest 2.0-litre TDI turbodiesel van engine as the Crafter. Power outputs are 102hp, 122hp and 140hp for the single-turbo verision, plus 177hp for the twin-turbo; torque ranges between 300 and 410Nm. At launch in 2017 it was front-wheel drive (FWD) only. But as with the Crafter, rear-wheel drive (RWD) and all-wheel drive (AWD) versions of the TGE were gradually introduced during 2018, and we have driven examples of all of them. A six-speed manual gearbox is standard on all models, but you can have an excellent eight-speed automatic transmission as an extra-cost option. Gross vehicle weight (GVW) for the range goes as high as 5.5 tonnes (5,500kg) – though as ever, 3.5 tonnes (3,500kg) remains the highest GVW you can drive on a regular car licence. Standard, Long and Extra-long variants are offered with Standard, High or Super high roof options; you can specify it with a loadbay of up to 4,855mm in length and 2,189mm of height. 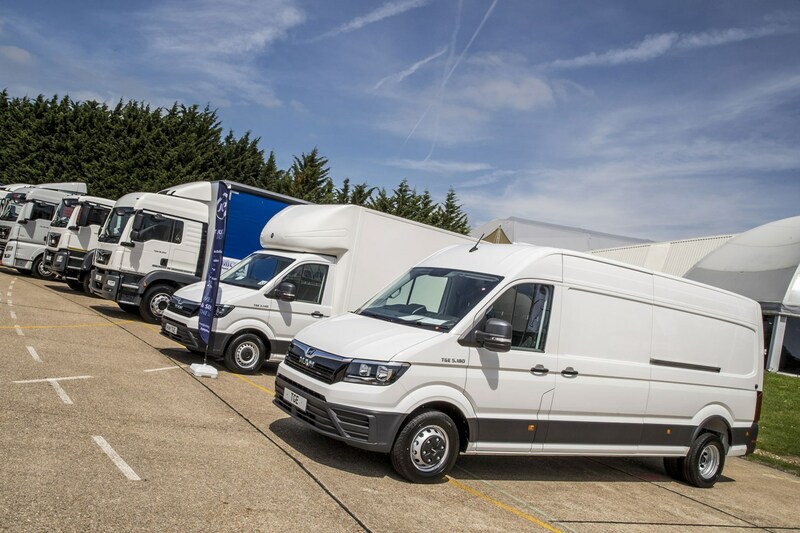 In addition to regular panel vans, combi variants with extra seats and chassis cab variants are also available, alongside a ready-made set of conversions, launched at the CV Show 2018 and marketed under the Vans to Go name. Pricing is similar to the Crafter, but the big difference is in the servicing and support package, which mirrors that offered for MAN’s big trucks. So, you get 24/7 roadside assistance and parts backup – important for those who run long and hard outside of the standard working week. MAN says that the TGE is aimed primarily at those fleets that already run trucks, and have a business-critical need for this 24-hour package. What are the TGE’s standout benefits? 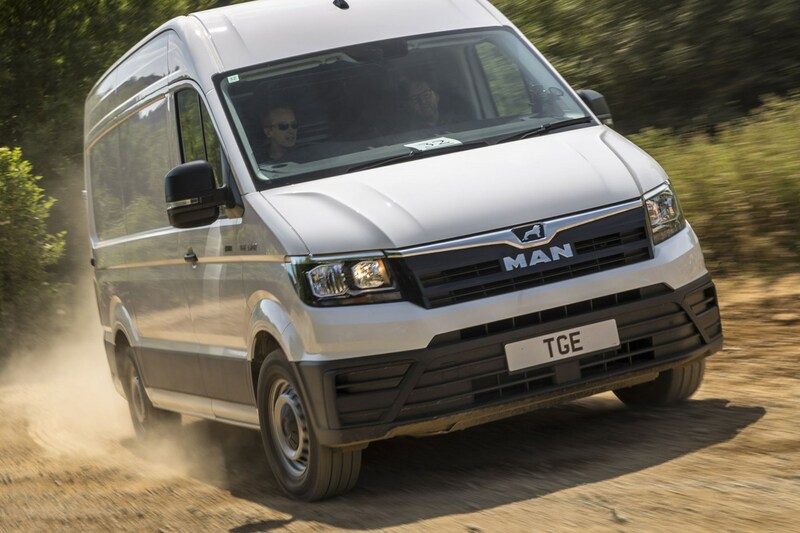 UK versions of the TGE get what MAN calls the ‘comfort’ driver’s seat as standard, supporting our impression that this is a van built to cover long distances painlessly. It’s supremely easy to drive, and is available with a wide selection of advanced driver-assistance and safety systems. The main question is whether you’d buy one in favour of its Volkswagen-badged sister. If you want the best servicing package available, and you are located nearer a MAN dealer than a VW one, then the answer to that question is an easy ‘yes’. 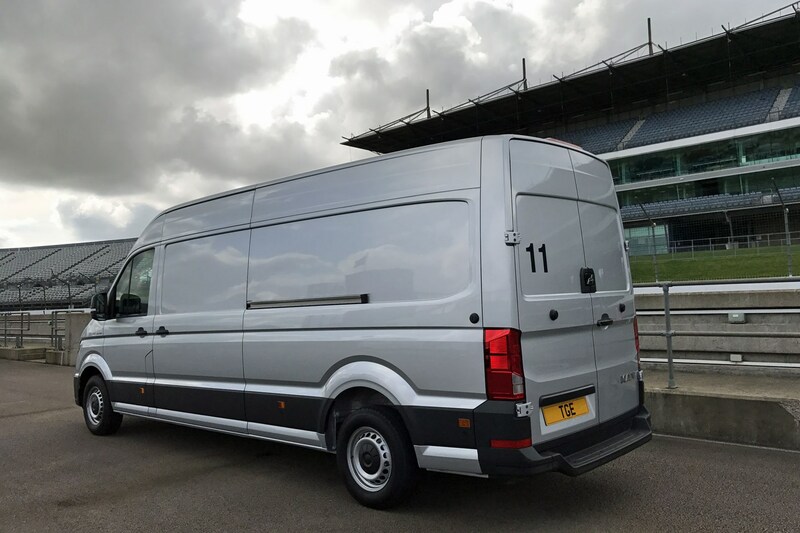 While it can't match more basic rivals for payload, and lacks the ultimate high-tech sophistication of the latest Mercedes Sprinter, in our opinion, the TGE is an excellent choice of large van. Unsurprisingly, the MAN TGE drives like a VW Crafter. But since the Crafter is one of the friendliest large vans on sale from behind the wheel, you can chalk that up as a significant win. 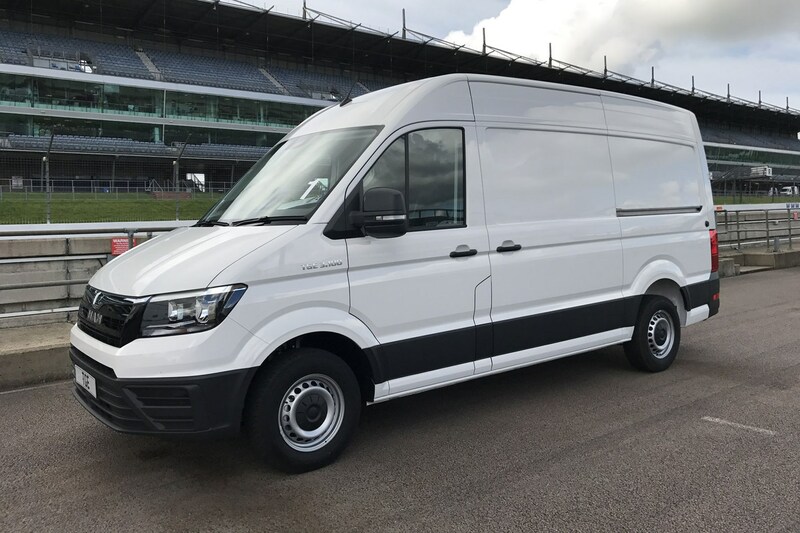 Having sampled all but the 122hp version, it's clear that this 2.0-litre engine is more than up to the job of getting this large van moving. The 102hp TGEs are acceptably brisk, while the 177hp model feels decidely rapid – up to and beyond UK motorway speeds. This leaves the 140hp engine as a sensible middle ground, and the option most operators are likely to choose. What’s the MAN TGE like to drive? 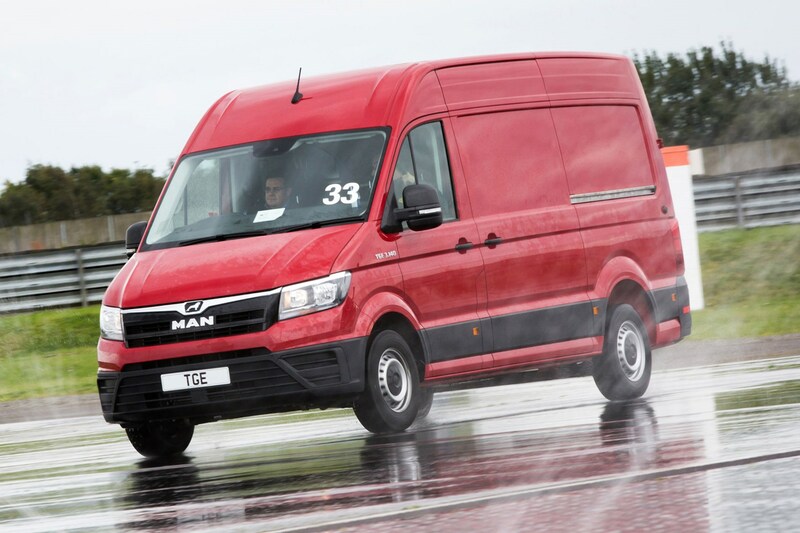 As well as travelling 1,000s of miles on the road at the wheel of the essentially idential VW Crafter (click here to read our long-term test), we've also driven the TGE on racing circuits and test tracks, allowing us to stretch its limits in ways that wouldn't be possible on the public highway. For example, we've circled a high speed bowl at 100mph while carrying a 750kg payload, and tried an unladen front-wheel drive TGE on a skidpan during a simulated rainstorm. In both instances the MAN van proved unflappably stable and secure from behind the wheel. Combine this with light yet accurate electric power steering that makes it as easy to handle as a car in all but the tightest situations, and you've got a van that's a genuine joy to drive in almost any circumstances. The manual gearchange is light and slick to use, while the eight-speed automatic is responsive and loses nothing in terms of flexibility of use compared with the manual. The auto should theoretically reduce your clutch replacement costs, too. The TGE's suspension set up is the same as the Crafter's, and so it shares its sister van's exceptional ride comfort and compliance. As a result it's comfier over long distances than many cars. Especially since the MAN gets an upgraded 'comfort' driver's seat as standard. A selection of suspension upgrades are available on the options list, meaning the TGE can be further tailored for heavy duty work. Front-wheel drive (FWD) TGEs are the most refined, have the lowest loading height and higher payload ratings spec-for-spec. Rear-wheel drive (RWD) variants suffer from a slight increase in vibration and noise, which can be felt in the cab. They should be better for particularly heavy payloads and towing, however, which is worth keeping in mind. All-wheel drive (AWD) TGEs don't look much different from the outside, but with the ability to send power to the axle with the most grip on demand – in other words, without any need to mess about with switches – they calmly negotiate slippery surfaces with very little fuss. The limited ground clearance means they aren’t suitable for very heavy off-road work, and there is no low-range gear setting like you’d find in many pickups. But a locking rear differential is an option, and if you need a van that will make light work of unpaved tracks when recquired the TGE is certainly capable. The MAN TGE has a brilliant driver’s cab. It’s well-made, practical, and a nice, comfortable place to spend time. 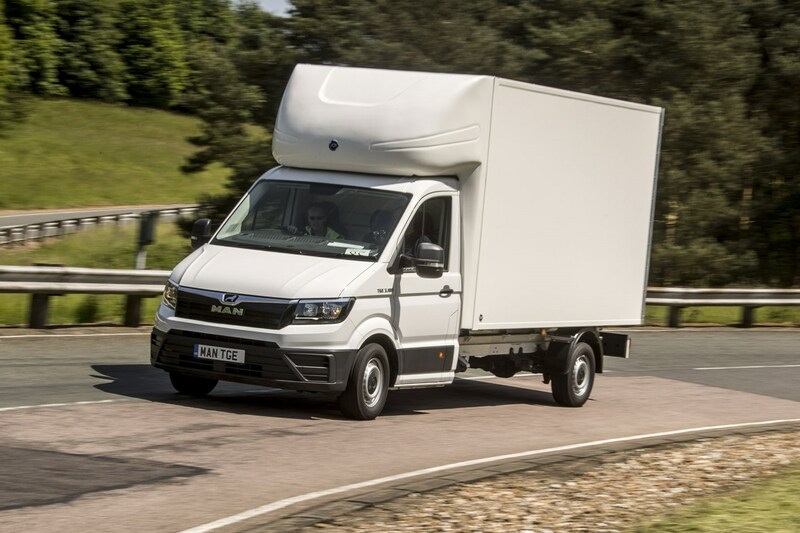 Yet another asset the TGE borrows from the Crafter, placing it above all other large vans – with the possible exception of the 2018-on Mercedes Sprinter, and even that struggles to match its German rivals for quality and functionality. 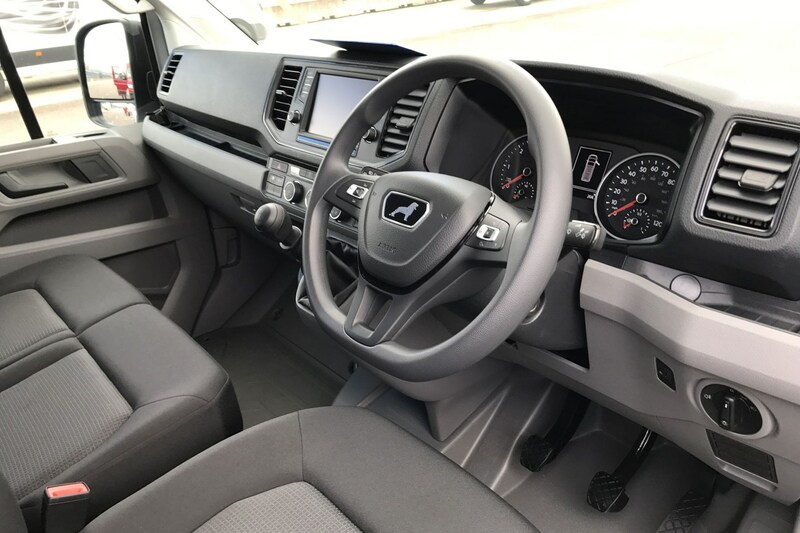 Major plus points are its big, clear instruments, solid and chunky stalk controls and infotainment set-up, and the copious amounts of storage space in the cab. We’ll give it a thumbs up, too, for its large dash-top cubbies (although shame they aren’t covered), quartet of generously-sized cupholders, and sensibly-designed overhead bins. Want to work in your cab? Then the folding centre seat (to form a desktop) and plentiful power sources are all very useful. The availability of heated windscreen, seats and steering wheel all make life easier, too. 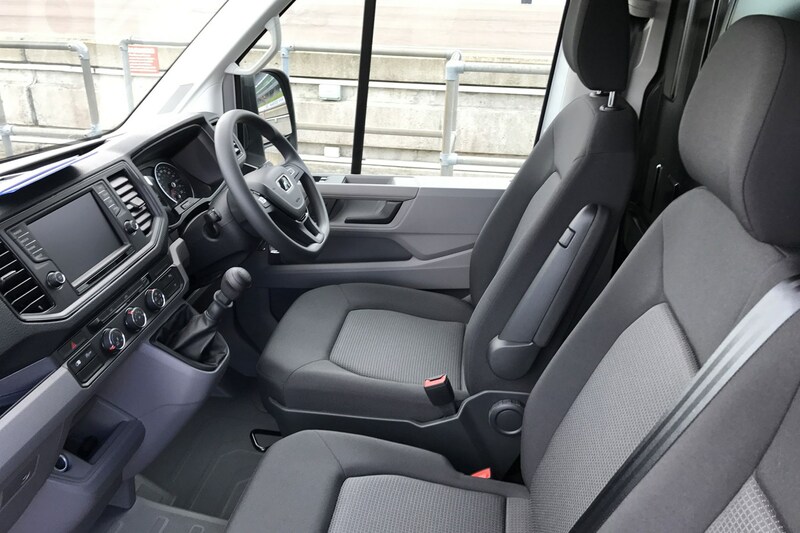 And while optional, the VW-derived touchscreen infotainment system and in-cab connectivity can't match the latest Sprinter for clever, high-tech features - the TGE's is nonetheless simple and straightforward to use. MAN does not sell the TGE in different trim levels – there is just a single specification, and a lengthy options list. 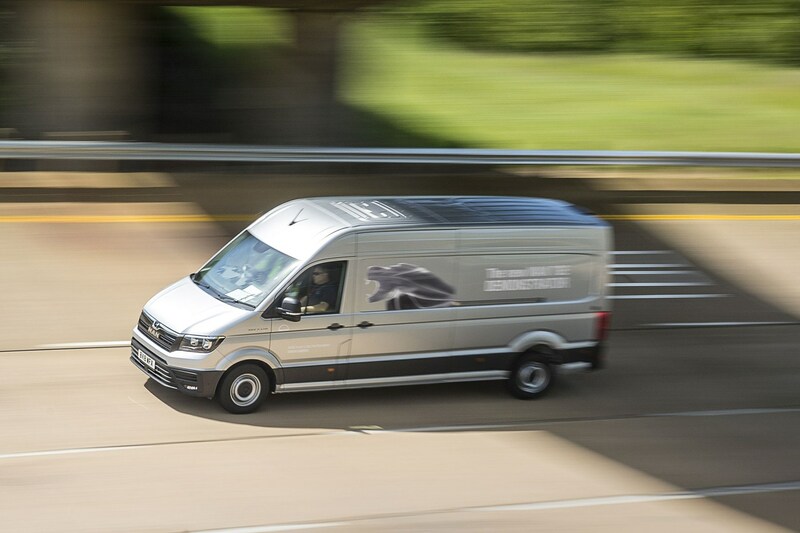 We’ve detailed the standard equipment below, but spec-for-spec, the MAN is typically priced very competitively versus its VW Crafter cousin, especially when you consider the extensive service and maintenance backup available through the MAN truck dealer network. This means it’s also on the costlier side compared with almost every rival bar the Mercedes Sprinter. This is not the same as saying it’s poor value, however – the phrase ‘you get what you pay for’ applies as well here as it does anywhere else. Fuel economy isn’t the TGE’s strongest area. Literally every rival in the large van class (bar the Crafter) offers better on-paper efficiency than the 38.2mpg best MAN offers. Opt for the more powerful 177hp engine, or one of the bigger body sizes, and won’t even get that. Real world economy will be closer to 30mpg, regardless. A stop-start system is fitted as standard. 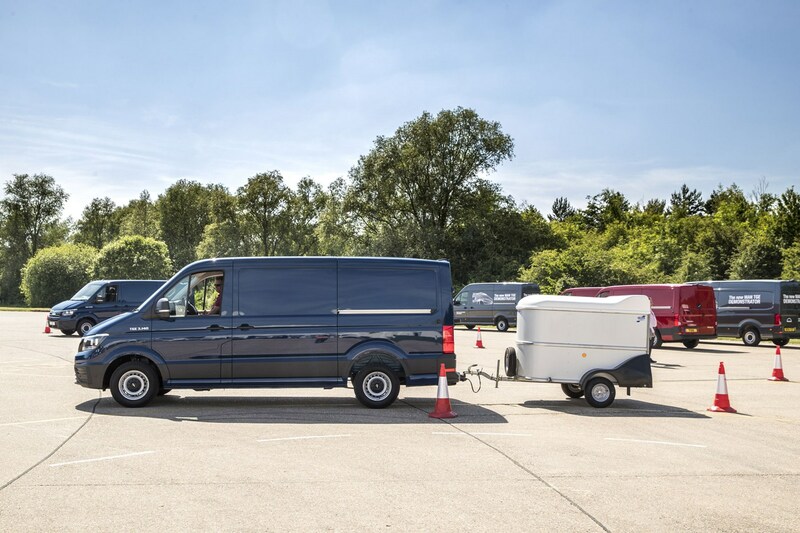 Like most large vans, the TGE uses AdBlue to meet Euro 6 emissions regulations; each tankful should last around 5,000 miles, depending on how and where you drive. Service intervals fall every 30,000 miles, though the trip computer will monitor this and alert you whenever a service is required. MAN offers a choice of service contracts (or maintenance plans), and every TGE comes with a MAN Mobile24 24 hour roadside assistance package should the worst happen. Note: safety equipment – of which there is a lot – is detailed separately in the safety section. The real highlights here are comfort driver’s seat and the cruise control, which will improve longer journeys especially. The bodybuilder module makes every TGE sold in the UK suitable for conversion for specialist use, which may be a particular benefit when buying or selling used. However, we’re surprised that air-conditioning isn’t considered an essential these days (though it may also impact fuel economy). You’ll also need to pay extra for fitted sat-nav – this is a VW-based system, and among the more user-friendly offerings on the market. Beyond all of this lies a vast options list, so MAN has sensibly collated some popular selections into various equipment packages, adding both convenience and value. Here’s a quick breakdown of what’s included in some of the more interesting equipment packages. 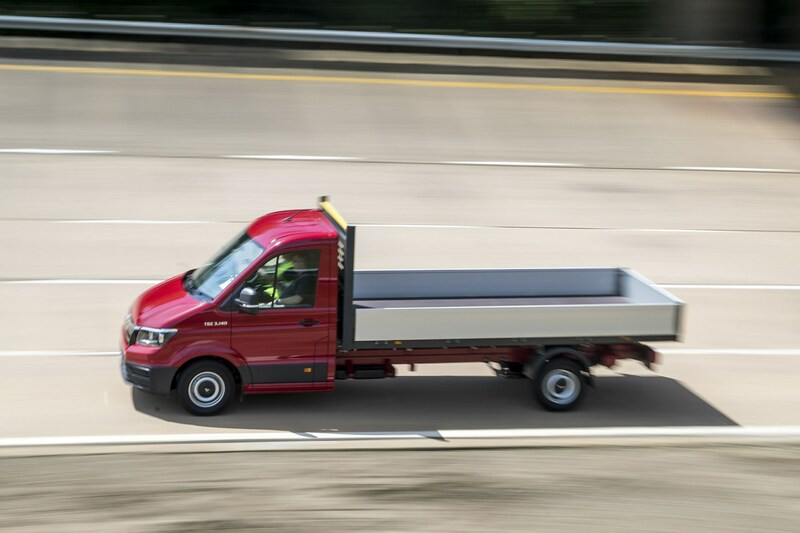 In addition to these, MAN also offers a pair of safety packages (detailed in the safety section below) and a trio of industry-specific packages. Two of these are aimed at tipper and dropside conversions. 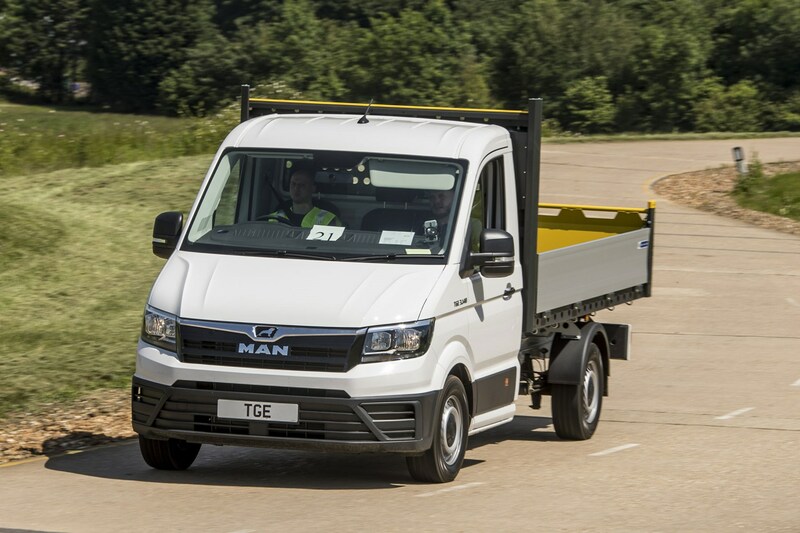 The MAN TGE should offer the same reliability as the equivalent VW Crafter – but because both models are all-new as of 2017, at the time of writing (June 2018) we have no further data. 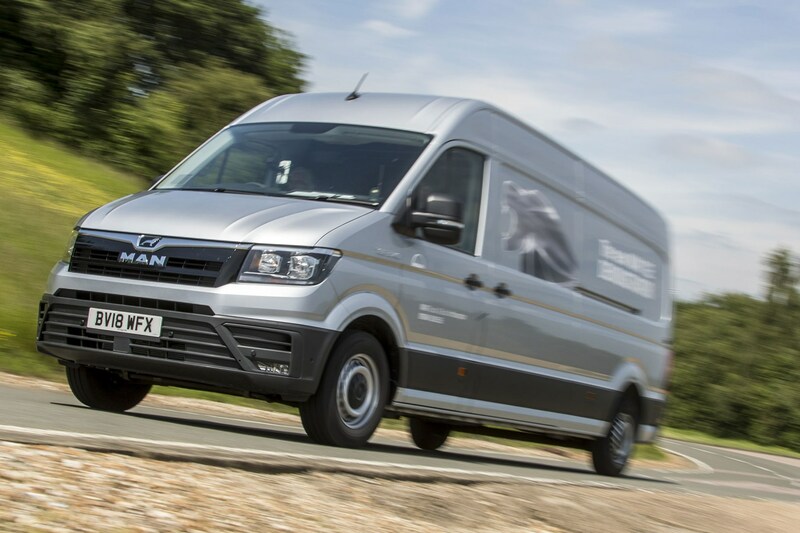 VW generally performs well in the FN50 van reliability survey, and we have no reason to think the Crafter – or TGE – will be any different. But we’ll update this if we hear anything to the contrary. 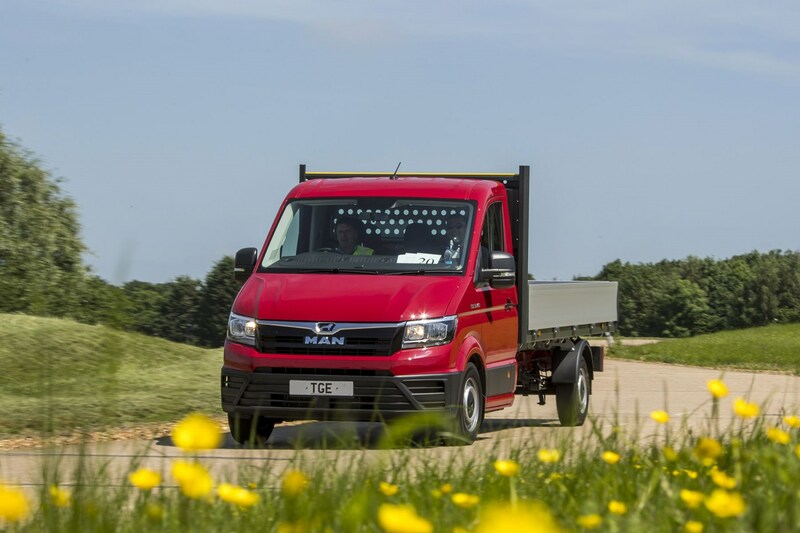 Should the worst happen, all MAN TGEs come with a 24-hour roadside assistance package, and the MAN dealer network is very much geared towards minimising downtime, as it is used to doing for the same for trucks, where downtime is even more critical. 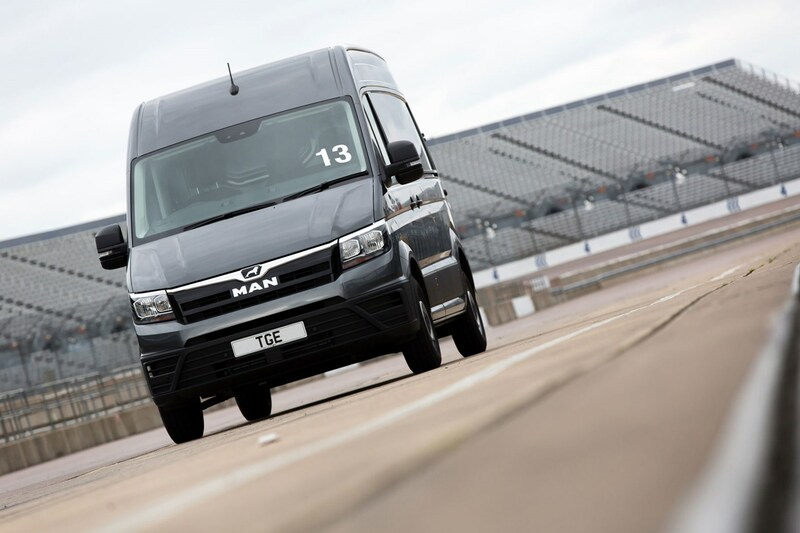 As any modern van should, the MAN TGE places a strong emphasis on safety, offering not only autonomous emergency braking (AEB) as standard equipment, but also a number of high-tech optional systems as well, many of which are made possible by the electromechanical power-steering system. Not bad. You do still have to pay extra for additional airbags, but this may only be worthwhile to your business if the TGE is regularly carrying more people than just the driver. Other potentially damage-preventing technologies include a self-parking system (yes, the TGE will parallel park itself with this fitted), and a trailer assist system that makes reverse parking with a trailer exceptionally simple. Honestly, this last is almost mind-blowingly clever, and involves steering the van with the electric mirror adjuster. Bonkers, but brilliant. The only security equipment you get as standard on the MAN TGE is an engine immobiliser. Oh, and remote locking, which hardly counts. A factory-fitted alarm is an optional extra. As ever, van security is a sensitive subject. 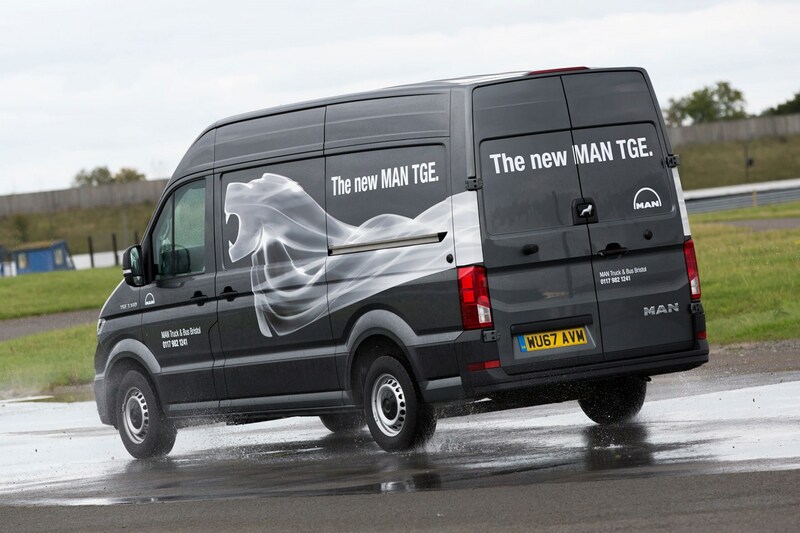 We’d expect the TGE to withstand a casual, opportunistic attack, since it’s one of the newest vans on the market. But nothing can stop power cutting tools. So if you can’t afford to lose something, don’t leave it in the van. Which MAN TGE is best for me?